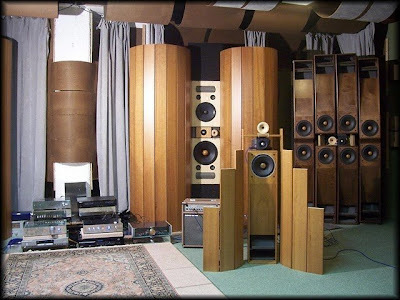 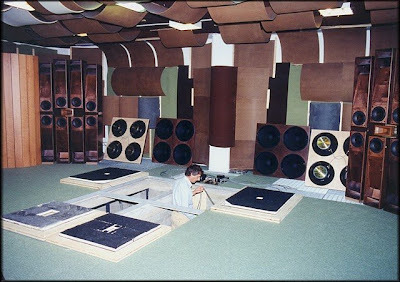 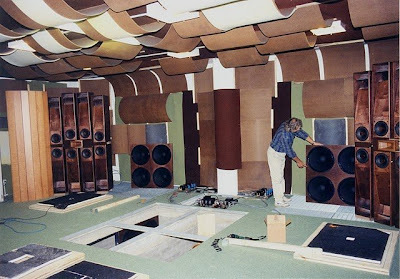 Royal Device has on its own developped and built in Italy the biggest subwoofer of the world for an Audio/Video room that can be also considered as the greatest AUDIO ROOM for private music listening of the world. 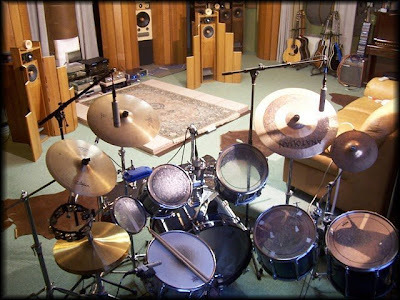 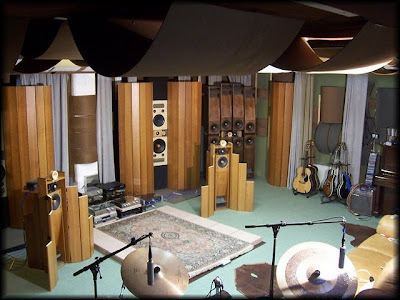 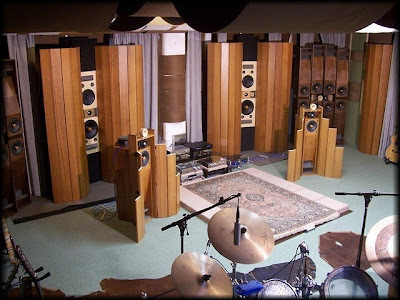 The Royal Device audio room belongs to Roberto – the audio designer who made it. 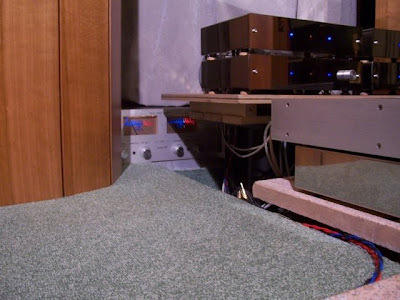 The audio reproduction is focused on the speakers output capability more than electric power output of the amplifiers with no need of KWatts power supply lines, releasing more than 110 dB/1W/1 meter sensitivity starting from below 10 Hz focused on the listening position. 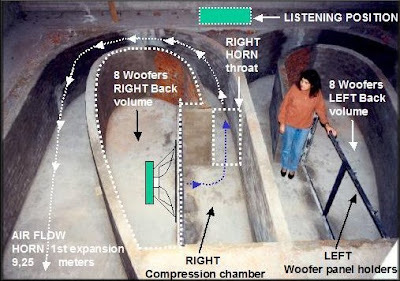 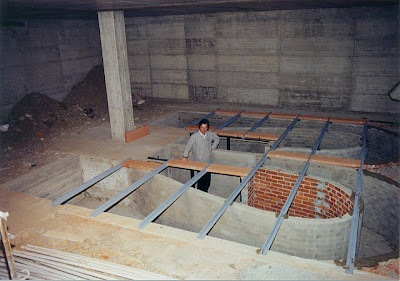 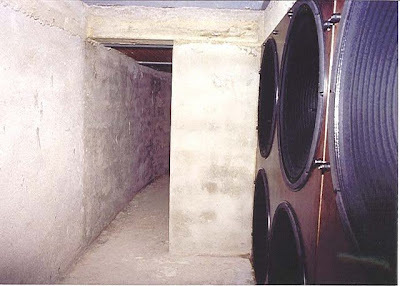 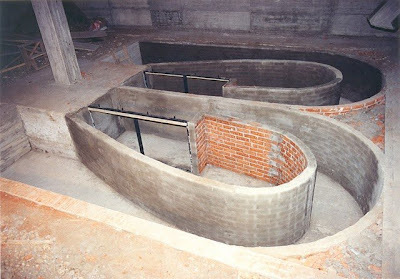 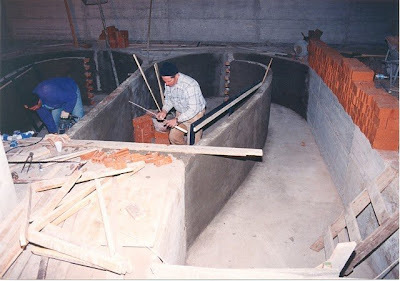 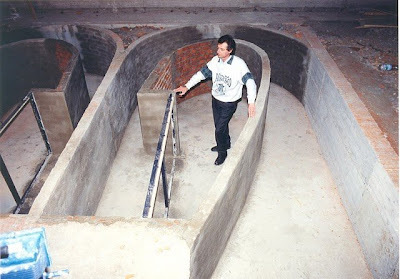 SUBWOOFER horns are built underneath the floor in a cavity of 1 meter deep. 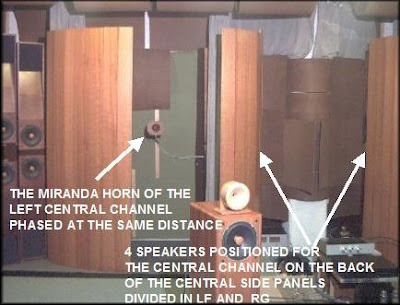 Each horn is driven by 8 x 18″ (47 cm) woofers. 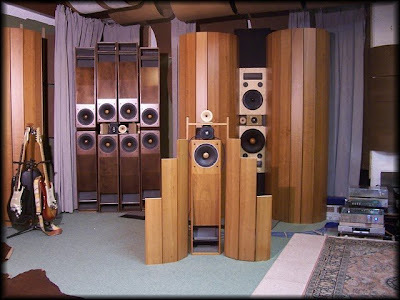 A total of 16 woofers. 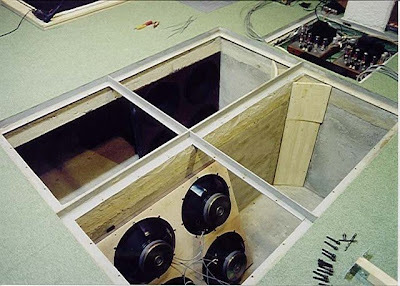 The SUBWOOFER efficiency is 120dB/ 1 Watt/1 meter. 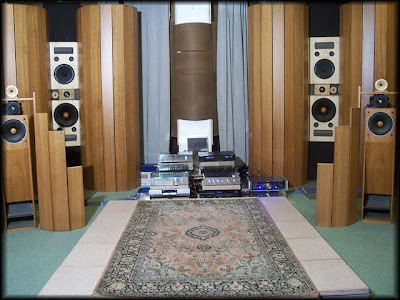 So the need of external regulation to adapt to the remaining audio system. 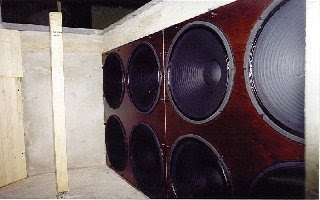 The total electrical capability of the 16 x 48 cm woofers is about 400 W peak power per woofer that means about 400 x 16 = 6400 W peak total (practically uselss). 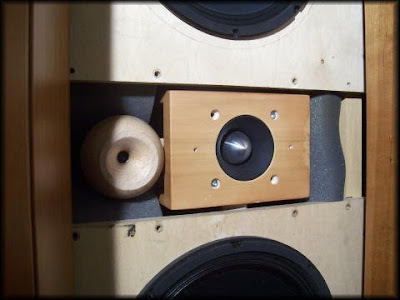 Each woofer features a 100 mm coil. 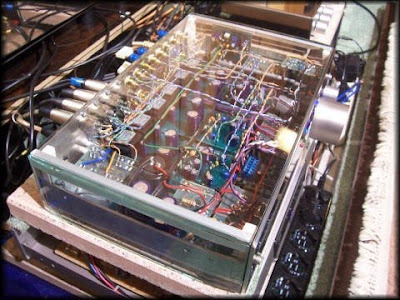 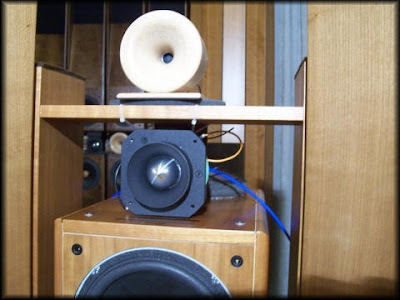 The real maximum power fed to both subhorn measured with an oscilloscope at the highest musical peak was 6 watts per channel when a pair of tube amps were used to drive the 16 LAuras, while up to date the electric power can reach 60 watts per channel using the 4 x 50watts/ch BLU EYES amps. 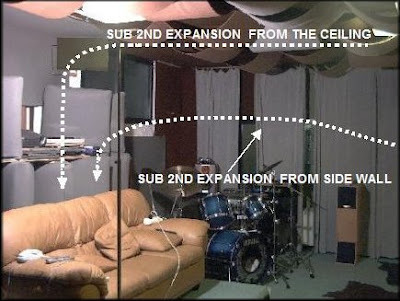 In this conditions, peak levels are much higher and undistorted than any live concert at all. 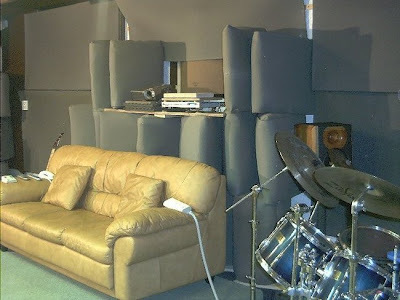 Walls and ceiling seems to fall down, but fortunately don’t. 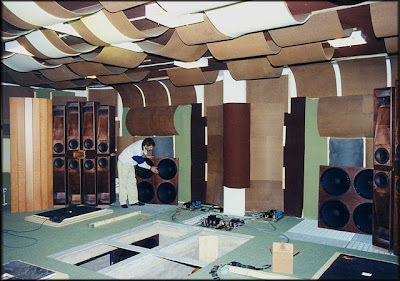 The sound pressure is concentrated at the listening point and stopped by a 2 meters high woolglass anechoic wall on the back of the listening position. 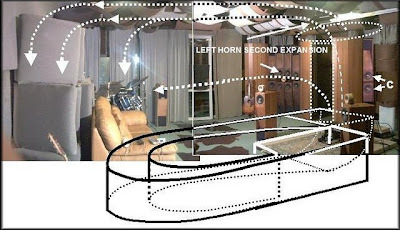 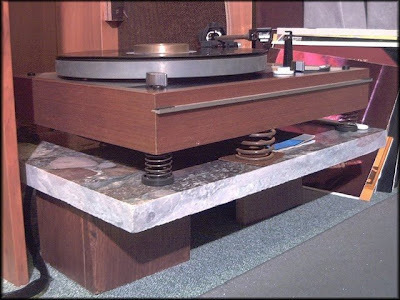 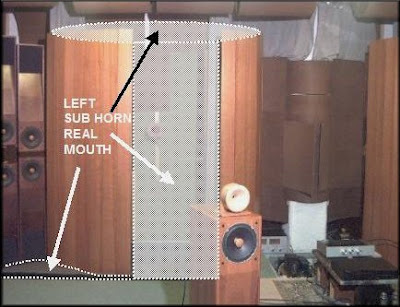 We should remember that the total diaphragm surface of the woofers is 2.89 square meters (8.67 square feet) and with the drivers horn loaded (not direct radiating), distortion at 60 watts is practically negligible. 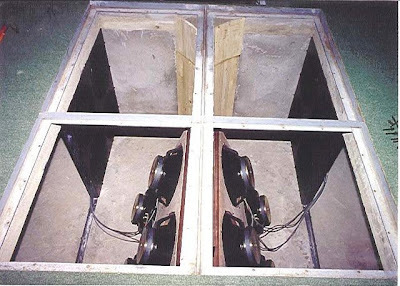 If for instance the real maximum rated power (6400 watt) would be used the pressure level would reach 160 dB, but I wonder who could survive. 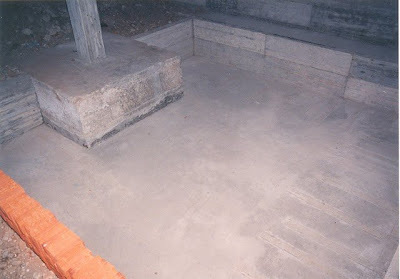 Not even the house built in steel & concrete maybe would stand up. 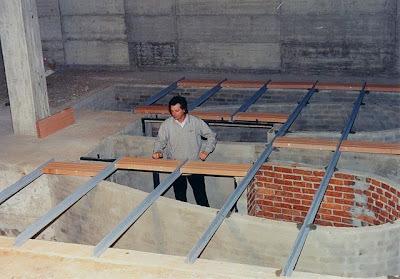 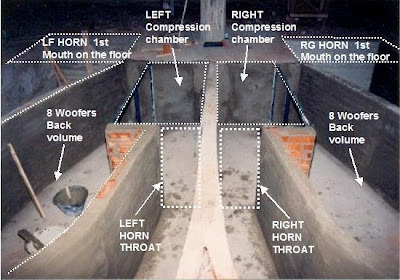 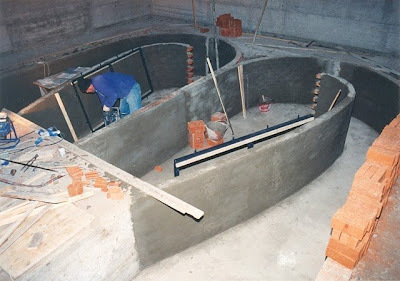 SUBWOOFER horns are built underneath the floor in a cavity of 1 meter deep. 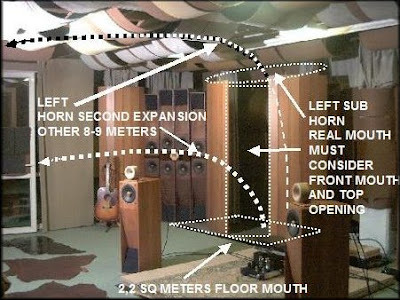 Each horn is driven by 8 x 18″ (47 cm) woofers. 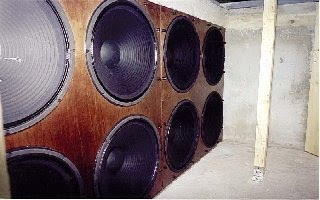 A total of 16 woofers.